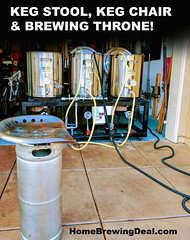 MoreBeer.com Coupon Code Description: Use the More Beer promo code BEERDEAL and Save $35 On A Brew Built Home Brewing Kettle! 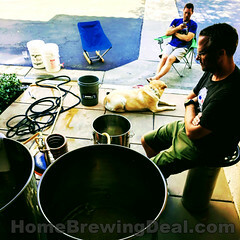 These More Beer, BrewBuilt home brewing kettles are great! They are also a real bargain when you consider that they have whirlpooling functionality built right in! Whirlpooling has become more and more popular among the homebrewing community, and with good reason. There are several distinct advantages that any brewer can gain by whirlpooling, including increased hop utilization, improved beer clarity, and faster chill times. 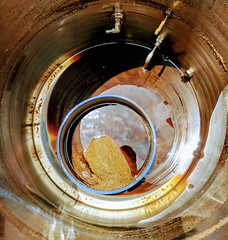 The vertical placement of More Beer’s whirlpool arm allows for efficient whirlpooling, while still being low enough to allow for half batches and avoid splashing/hot-side-aeration. Although the whirlpool method can be applied by simply stirring your wort with a spoon or mash paddle, pairing a purpose-built whirlpool kettle with a brew pump will vastly increase efficiency and decrease the risk of contamination. The character imparted by late hop additions can be greatly improved when added during whirlpool. Below boiling temperatures plus constant circulation leads to extracting more flavor and aroma from the hops, while contributing far less bitterness than when added during the boil. Perhaps one of the biggest benefit of whirlpooling is reducing the amount of trub passed to the fermenter. When transferringyou want to leave as much of the trub behind as possible. Clearer wort going into your fermenter means clearer beer when fermentation is complete. In large amounts, trub can also impart off-flavors to your finished beer. Creating a whirlpool directs matter toward the center of the kettle and, when allowed to settle, form a cone that’s much easier to keep out of your fermenter during transfer. Lastly, if you’re using an immersion chiller to cool your wort, a whirlpool can significantly reduce your chilling time. 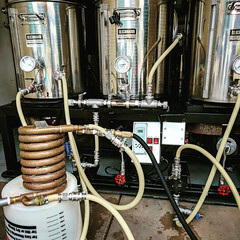 Using a whirlpool to create a rotating flow will assist the transfer of heat from the wort to the water running through the chiller, leading to a faster and more efficient cool down. MoreBeer’s BrewBuilt brew kettles are made from 304 stainless steel! They offer an unparalleled mix of features for a great price. At the very top of the list are three welded-in-place couplers that offer a lifetime of leak-free use. As you can imagine, welding in a coupler costs more than punching a hole and using a gasketed (i.e. weld-less) fitting. Welded fittings offer a permanent connection that, in our opinion, is worth every penny. The second unique feature that we absolutely love about these brew kettles is the notched lid with silicone plug. Some other features we dig include the internal volume markers from the bottom to the top – so handy for instant reads. The silicone sleeved handles on the kettle and the lid are a cool feature to protect your hands. The tri-clad bottom with a 4mm core of aluminum sandwiched between two layers of stainless steel offers even heat distribution during the boil and also makes it a perfect choice for anyone wanting to use an induction burner. The bottom coupler is also cool with 1/2″ male threads on the outside and 1/2” female threads on the inside. Those internal threads are so handy… you can easily install a pick-up tube, stainless quick disconnects, a kettle screen, or any other fitting that features 1/2″ MPT threads. Save an Extra $20 On A 14 Gallon Stainless Steel Home Brewing Kettle With Two 1/2 Ports! Coupon Description: Today only, use morebeer.com promo code BEERDEAL to save $20 on this Stainless Steel 14 Gallon Homebrewing Kettle. This is a homebrewing 14 gallon stainless steel kettle with two 1/2″ couplers welded to the front. The ports are ideal for adding a thermometer and ball valve ports. These home brewing kettles are the most economical out there and are an amazing home brew value. The bottom coupler can be threaded on the inside of the kettle as well which is great for a diverter or kettle tube screen. These stainless steel homebrewing kettles may also be used as a mash tun with one of MoreBeer’s AG405 domed false bottoms.